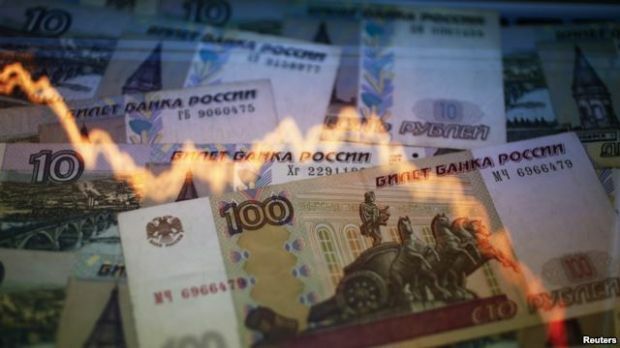 Russia’s ruble currency, already the worst performing in the world, suffered fresh woes on Tuesday, with its rate against the euro even hitting RUR 100 at one point, before it recovered slightly. As of 1515 on Tuesday, the ruble was trading at RUR 73.18 to the dollar, and RUR 91.74 to the euro, according to currency site xe.com. As of 1428 Moscow time, the dollar rate for "tomorrow’s settlements" had grown by RUR 6.90, to RUR 71.35, while the euro was up by RUR 10.20 to RUR 89.10, according to Russian information agency TASS. A number of Russian banks actively operating in retail currency exchange market have started to buy new 5-digit quoting boards with three characters before the decimal point and two after. As earlier reported, after the collapse of ruble to a record low early on Tuesday, Russia’s Central Bank sharply raised its key interest rate from 10.5% to 17%. On the previous day, December 15, the Russian ruble lost more than 10% of its value, becoming the worst-performing currency in the world this year. Over the day, foreign currencies rose by as much as six rubles, exceeding the level of 64 rubles per dollar and almost reaching 79 rubles per euro.